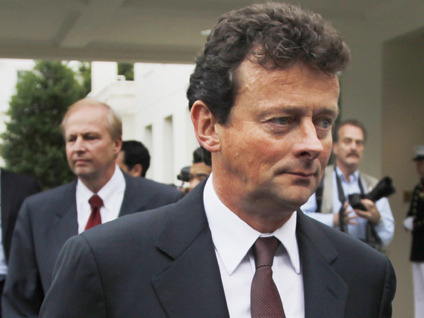 It's now official: BP's Tony Hayward is out, and Managing Director Robert Dudley is in. The announcement came after BP reported a $17.15 billion second quarter loss due to the more than $32 billion in charges related to the spill in the Gulf of Mexico. The company plans to sell about $30 billion in assets to replenish its coffers. Shares of BP are up 0.7% in the premarket. This morning, investors are eagerly awaiting the 9:00 a.m. ET release of the S&P Case-Shiller Home Price Index, which is a three-month average ending in May. Recent home sales data suggest that home prices are likely to fall, but it could take time for the impact to be seen in the house price index. Yesterday, the Census Bureau reported that June New Home Sales were at a seasonally adjusted, annual rate of 330,000, a 23.6 percent increase from May. Despite the apparent positive headline, June 2010 was still the worst June on record, and the spike is exaggerated because the previous month was revised substantially lower. Still, the market appears to be driven more by corporate earnings at this point. With just about 1/3 of S&P 500 companies reporting, earnings are running ahead of expectations, propelling stocks to slightly positive territory for the year for both the Dow and the NASDAQ  the S&P 500 is less than a tenth of a point away from where it was on December 31. In the premarket, Asian stocks are mixed, while European markets are trading higher. U.S. stock futures are currently indicating a positive opening  though there's a long way to go until 4:00 p.m.!